Master Sgt. Kelly L. Hornbeck, a Special Forces team sergeant assigned to 3rd Battalion, 10th Special Forces Group (Airborne) at Fort Carson, Colo., was a 36-year-old native of Fort Worth, Texas. He died Jan. 18, 2004 in Iraq from wounds sustained when an improvised explosive device detonated during a combat patrol near Baghdad. Hornbeck enlisted in the Army in 1987 and first trained as an infantryman at Fort Benning, Ga., where he would later serve as a drill sergeant. Hornbeck’s initial assignment was with the 3rd Infantry Regiment, “The Old Guard,” at Fort Myer, Va. 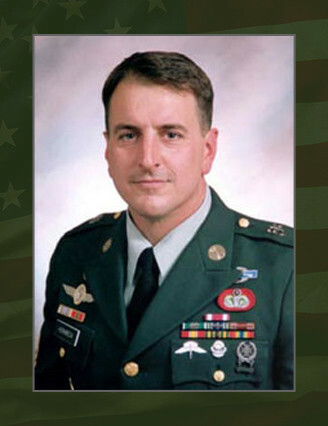 Following his initial enlistment, he volunteered for duty with the U.S. Army Special Forces in 1990. After training as a Special Forces weapons sergeant, Hornbeck went on to serve in the 7th and 10th Special Forces groups. During his career as a special operations Soldier, he served as a combat diver, a military free fall parachutist and a jumpmaster, among many other duties. Hornbeck was also a graduate of the U.S. Army Ranger Course. His awards and decorations include the Bronze Star Medal, the Purple Heart, the Meritorious Service Medal, the Army Commendation Medal, the Army Achievement Medal, the Good Conduct Medal, the National Defense Service Medal, the Noncommissioned Officer Professional Development Ribbon, the Army Service Ribbon, the Combat Infantryman Badge, the Expert Infantryman Badge, the Drill Sergeant Identification Badge, the Military Free Fall Parachutist Badge, the Master Parachutist Badge, the Air Assault Badge, the Combat Diver Badge, the Ranger Tab and the Special Forces Tab. Hornbeck is survived by his daughters, Tyler Rae Hornbeck and Jaqueline McCall, and his parents, Jeffrey and Camille Hornbeck.